Jonathan (Elgort) lives his life to a strict routine. By day, he works part-time as an architect; keeping up with his chores and in bed before 7pm. Every night, he also leaves video messages to an identical man named John (Elgort), recapping his day. John in turn does the same, but recapping his night. Where Jonathan is cleancut and reserved, John is unkempt and relaxed. The nature of their relationship slowly unfolds to reveal a unique familial connection. In a literal sense, Duplicate is about Jonathan as caretaker, with John the one who needs care to allow him to grow and thrive. But this is not exactly a literal film, and abstract layers of science fiction reveal more to be going on with the film thematically. 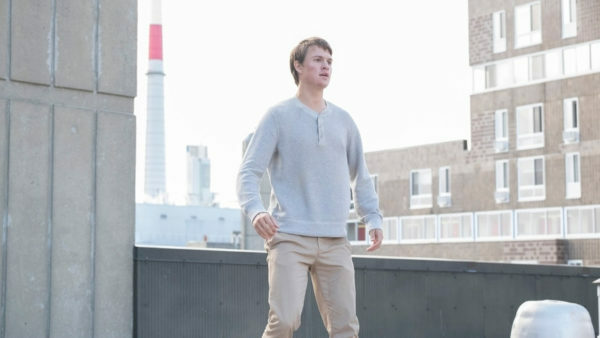 Elgort gives a perfectly subdued performance as Jonathan. We only see John through his video messages, but again, Elgort’s portrayal is perfectly suited to subtly display the character differences. Tonally, the film is also quite subdued, carried by a calm underlying score. Taking inspiration for its tone and cinematography choices from Joachim Trier’s Louder Than Bombs, Duplicate explores similar themes with a similar level of intimacy, but lacks the masterful sophistication that Trier achieves. A particular example lies in the film’s finale, where expositional dialogue is used unnecessarily, to the great detriment of the ending’s impact. The buildup and previous dialogue is enough for the audience to understand the director’s intention, while the extra dialogue feels condescending to the point of ruining the mood. Duplicate explores a few different themes in its 95 minutes, all pertaining to what it means to truly live. While rules and routine are necessary for survival, they may also be holding us back from exploring other aspects of life that matter just as much, if not more. The dichotomy of needing family and needing space from them is also explored, suggesting that while we need them to nurture us, it is not until we get time to ourselves that we can truly discover who we are and want to be. Duplicate may have deeper layers underneath its slow-burning surface, but taken at face value, the film succeeds as low key, highly engaging Sci-Fi. This entry was posted on Wednesday, October 17th, 2018 at 3:09 pm	and is filed under Events, Features, Film, Review.